THIS EXCEPTIONAL LIEN HWA 47 COCKPIT MOTORYACHT IS INCREDIBLY CLEAN, AND IS A VERY SPACIOUS CRUISER OR GORGEOUS CONDO ON THE WATER~~ I recently had a total engine survey completed by Admiralty Marine to confirm the integrity of my Ford Leman 275 engines’. Overall they performed without issue, but did need some hoses, clamps and one sea pump to be replaced. All recommendations were completed as indicated in the report along with a complete engine service, oil and fuel filters along with transmission and Rancors. The engines are in the best shape in years with a new turbo and water pump installed as well. 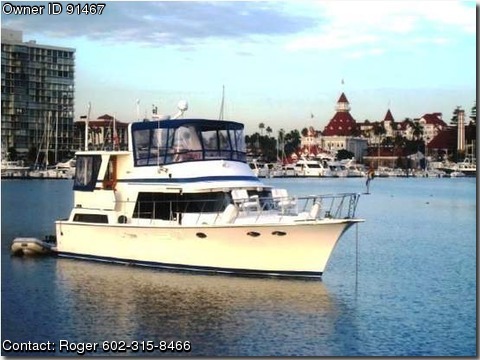 Included in the price is 30hrs of at sea training by a certified captain along with membership in The Point Loma Yacht Club in San Diego. Our club has reciprocals with almost every Yacht Club in the country. P.S The slip is transferable and is 6 boats in from the parking lot which makes it a breeze to load her up with groceries and other goods. Totally remodelled inside and out. New electronics, central air and heat, satellite bluewater TV system, carpentry throughout and designer furnishings. With 50 amps and direct city water hookup, this is a floating condo at sea or at dock. Excellent coastal or Mexico cruiser. Featuring the very economical Twin Ford Lehman Diesels. Boasting a great profile and a very spacious interior , the Lien Hwa 47 Cockpit MY has proven to be extremely popular. Her spacious two stateroom layout is arranged with the salon overlooking the galley and dinette below. The interior is completely finished with an abundance of well crafted teak woodwork. Addition popular features include very wide sidedecks, a teak cockpit and aft deck overlay hardtop, and a folding arch.